ST. LOUIS (CNS) — The key to peace and justice is kinship, said a Jesuit priest who has worked with Los Angeles gangs for years. “If kinship were our goal, we wouldn’t be seeking justice, we’d be celebrating it!” Father Greg Boyle said June 29 in St. Louis at the assembly of the Association of U.S. Catholic Priests. That notion of kinship resonated with Father Robert Rosebrough, pastor of Blessed Teresa of Calcutta Parish in Ferguson, after hearing Father Boyle’s address. Father Rosebrough and several other members of the Ferguson Ministerial Alliance were among invited guests and members of the general public at the presentation. 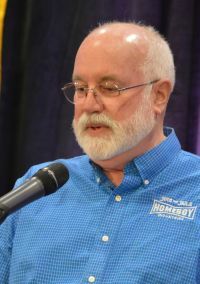 Father Boyle started Homeboy Industries in Los Angeles, providing jobs and educational opportunities for gang members and ex-offenders. Homeboy Industries runs bakeries, restaurants, a silk-screen company and other business that provide skilled trade opportunities. He also told of rival gang members, “Youngster” and “Puppet,” who had only hatred for each other, but who had to work together. After some six months on the job, a street gang beat and kicked Puppet, putting him on life support. He flatlined and died from his injuries. Youngster was distraught, offering to give blood or do whatever he could. “He was not my enemy, he was my friend,” Father Boyle quoted him as saying. “We worked together.” That new reality “was God’s dream come true,” said the priest. It was what Jesus prayed for, that we may all be one. Father Rosebrough said that Boyle’s notion of kinship “resonated with him and echoed a recent homily given by Pope Francis.” He said the pope said some people speak well and do good actions, but if they haven’t listened to each other, they are not following Christ. “You’ve got to listen to each other’s stories,” Father Rosebrough said, as the path toward kinship among factions and groups in a community like Ferguson. Father Rosebrough and other members of the Ferguson Ministerial Association continue to work toward healing the community following the violence and turmoil that followed the death of Michael Brown, an unarmed black teenager who was shot by a white police officer Aug. 9, 2014. The Association of U.S. Catholic Priests held its first assembly in 2012. According to its leaders, the group was formed to offer a national support group not before available to many priests and to promote “fulfilling the confirmed agenda” of the Second Vatican Council. The organization claims more than 1,000 members.